Churches in Israel are growing in evangelistic confidence and doctrinal care, even as they wrestle with the cost of being identified with Gentile believers. Too often Israel takes the forefront of the news and social media because of a terrorist attack, the issue of settlements, or a related political issue. Unfortunately, these negative headlines obscure something wonderful: God is on the move in Israel. The church in Israel is a paradox. Christianity began among the Israelites, yet the Christian church has been almost non-existent among Jewish people for nearly 2,000 years—and this despite the fact that there have always been Jewish people, even prominent rabbis, who believed in Jesus as their Lord and Messiah. However, since the revival of the Hebrew language in the eighteenth century and Israel’s establishment as a state in 1948, the church has become vibrant once again. The restoration of the land and language has paved a way for the restoration of God’s people here in Israel. The church is growing slowly and steadily, even though less than one percent of the population has been converted. Because of this, evangelism is atop the agenda for many churches. Yet the ground is hard. Many Jewish people see Christianity as the enemy of the Jewish people. Hitler was a “Christian,” so many Jews believe their people were persecuted and killed by “Christians.” In this context, evangelism is challenging. But in recent years, we’ve seen a more positive attitude toward Jewish-Christian believers in Israeli media and society. We’ve also recently seen those from younger generations come to faith. In the last year or so, our church has baptized young men or women every few months, and I’ve heard of similar occurrences in other churches. Some of these young converts are zealous not only to become active in the church but to deepen their understanding of the Scriptures. A few even want to pursue theological studies. How encouraging to see Israeli churches taking teaching and preaching more seriously, to see biblical ideas like a plurality of elders being practiced more and more. As the church has grown, churches have also become more involved in impacting society. From drug and alcohol rehab to soup kitchens, Christians are becoming known in Israel for their service to the needy and their positive impact on society. We pray the Lord will use these acts of service to draw people to himself. 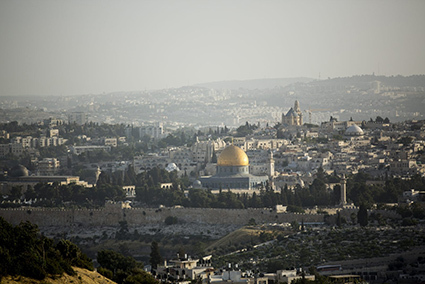 Despite these encouraging trends, the church in Israel still faces many challenges. Most pastors have a little formal theological study, much less a degree. For Hebrew speakers, there’s only one Israeli Bible college available where both Jews and Arabs can study theology. Expository preaching isn’t as common as it should be, though it’s gaining more and more ground in certain congregations. Because most churches can’t afford to pay a full-time pastor, many pastors in Israel have to work a non-ministry job or for a Christian parachurch organization. There’s also a great need for solid theological books. Due to the lack of Christian tradition in this part of the world, there simply aren’t many Christian books in Hebrew—either translations or original material. Most of the 66 books of the Bible don’t have a commentary, and there are no faithful systematic theologies or introductions to the Old or New Testament. We also lack books on the life and the health of the church. While most Israeli churches don’t have a written confession of faith, most would identify themselves with one of the more common theological streams: Charismatic, Pentecostal, Dispensational, Messianic, or Reformed. Church membership isn’t practiced as it should be, nor is church discipline. Like many other churches, the church where I serve has a basic baptismal class for new converts. We usually interview the candidate, wait to see him in the church for a while, and then invite them to participate in this class. At the end, we interview them again and only then will we conduct the baptism. All of these steps together are comparatively rigorous. While other Reformed churches have similar methods, they’re rarely this elaborate—and frankly, meaningful church membership is generally not practiced here. Another challenge the Israeli church faces is the issue of identity. In light of the harsh history of the “church” toward Jewish people, many want to distance themselves from “church,” “Christianity,” and other similar words that have left hard-to-forget memories. For example, my family often asks me, “How can you believe in Jesus when so many of our people have been killed and persecuted in his name?” Though I know in Christ we are one new man, at times it is hard to be identified with “Gentile” Christianity. Nonetheless, we are brothers and sisters. And one day, people from every tribe, language, people, and nation will gather together to partake of the great feast of the Lamb. Please pray for the church in Israel—those who serve it, and those who are a part of it. This entry was posted in Jewish Believers and tagged believers, church, israel, Jewish, messianic.